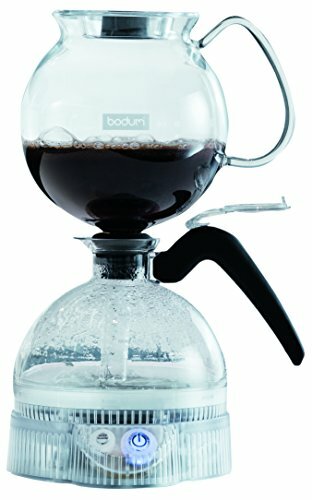 The electric Pebo vacuum coffee maker is the modern version of Santos, and has been a signature part of the Bodum range since 1958. 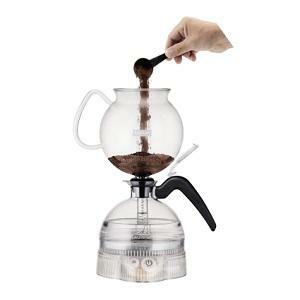 A lot of coffee has been drunk since our founder Peter Bodum introduced the Santos vacuum coffee pot back in the 1950s. 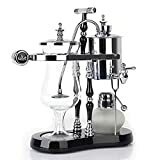 It was revolutionary at the time, not only because it made delicious aromatic coffee in no time at all, but also because of its patented filter. Being an integral part of the coffee maker, there was no need for either cloth or paper filters. 1. Coffee – Brews without boiling at the perfect temperature. 2. Funnel – Made of borosilicate glass, users can view the theatrical process from start to finish. 3. 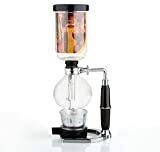 Filter – Invented by Peter Bodum in 1957. 4. Handle – Made of a soft, comfortable rubber; available in black and off-white. 5. Jug – Made in Tritan, 100% BPA-free. 6. Base – Automatically controls the four minute brew cycle.